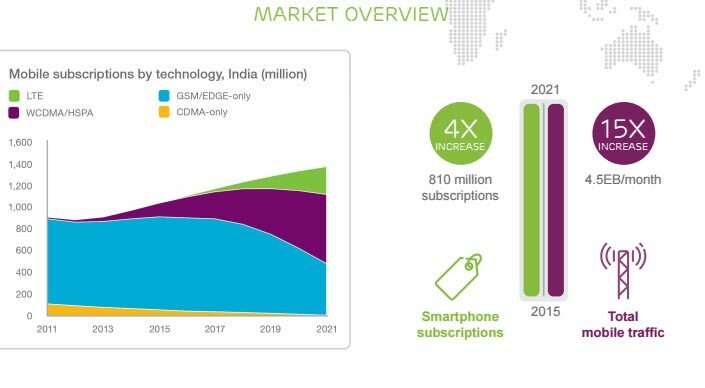 According to the Ericsson Mobility report, WCDMA/HSPA and LTE (3G and 4G) networks are expected to account for 65% of total subscriptions in India by 2021. The report points out India’s GSM/EDGE subscriber base will decline after 2016, while 3G and 4G connections will rise. Ericsson says operator initiatives will push the decline of 2G subscriber base, coupled with fall in smartphone prices, and bundling of data with devices. WCDMA/HSPA and LTE (3G and 4G) networks are expected to account for 65% of total subscriptions in India by 2021. “While WCDMA /HSPA population coverage is projected to increase to 90% by the end of 2021, the population coverage of LTE networks in India is expected to reach 45% by the end of 2021 in India,” said Paolo Colella, Region Head for Ericsson in India. Ericsson points out Indian smartphone users view data as more important than voice, and speed is a crucial factor, especially with younger users (aged 15-24 years). Only 50% users in India are currently satisfied with network performance for streaming videos on a smartphone while commuting, adds the report. For Indians streaming music and watching videos are the most popular forms of entertainment on smartphones, according to Ericsson’s Mobility report. WhatsApp Messenger is the top mobile app in terms of the number of Indian consumers, followed by Google Search and YouTube, while e-commerce apps such as Flipkart, Paytm and Snapdeal are growing in popularity, notes the report. Interestingly file sharing app Xender is the top mobile app by average monthly data usage, followed by file sharing app SHAREit and the YouTube video sharing app.